Hello friends! 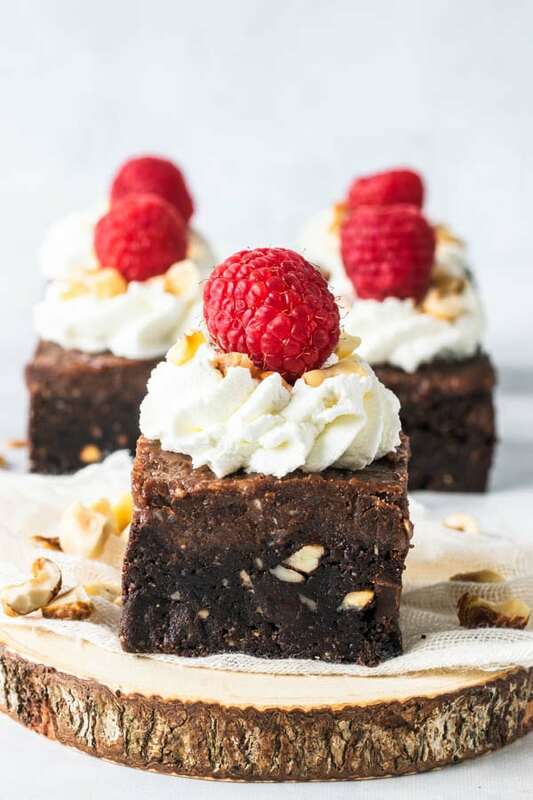 Today I am bringing a delicious and EASY vegan brownie recipe! 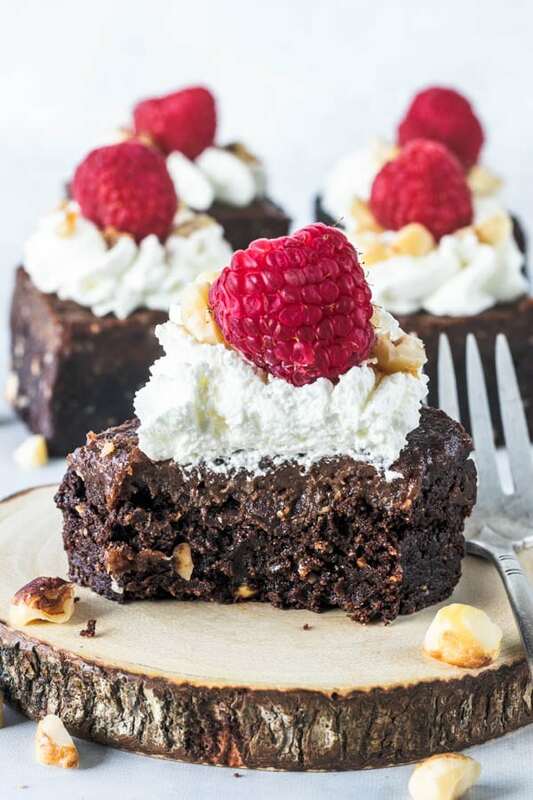 My Vegan Hazelnut Brownies with Vegan Nutella Frosting! Ta-da! These brownies are the fudgiest, so my biggest tip is: get them reeeeally cold before slicing, if you want to obtain perfect slices like mine. 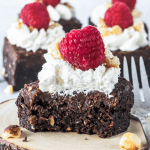 So, these fudgy vegan hazelnut brownies contain actual pieces of delicious hazelnut in the batter. And we top them with a vegan nutella frosting, so easy to make, and so delicious you won’t know what to do with yourself. Seriously, all you need for this Vegan Nutella Frosting is 7 ingredients (not counting a pinch of salt). That’s it. The only part is that you will have to soak the hazelnut prior to making this, which means there might be a little bit of waiting. It’s so worth it, though. 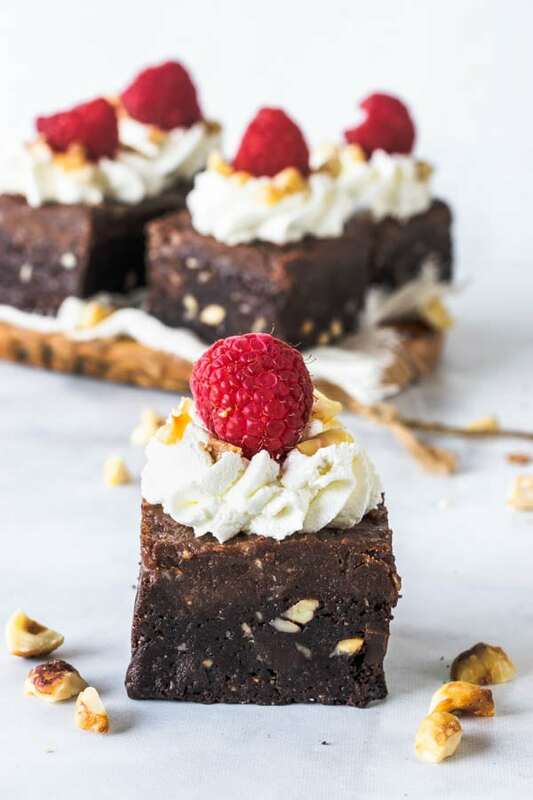 Once you taste these Vegan Hazelnut Brownies, topped with the delicious vegan Nutella Frosting, you won’t be able to think of anything else in life. 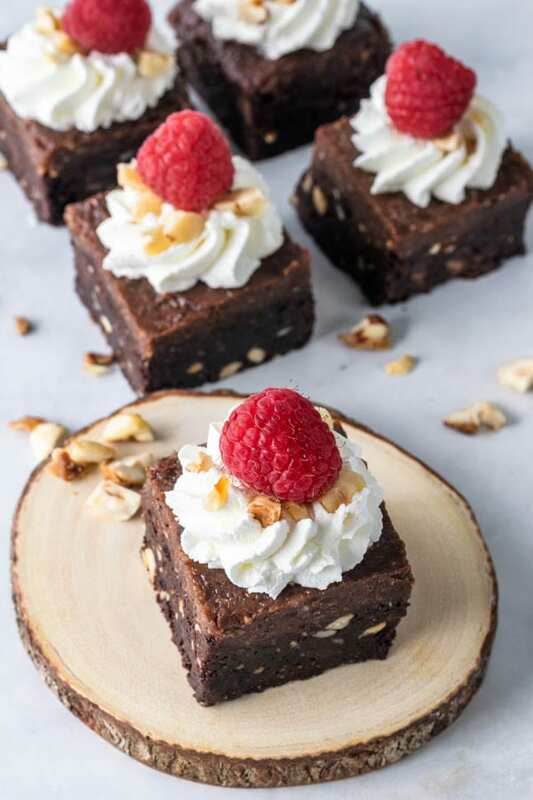 Also, don’t forget that these Vegan Hazelnut Brownies, and my vegan Nutella frosting, are paleo, gluten-free, and refined sugar free. I’ve been experimenting quite a bit with vegan and paleo desserts lately. 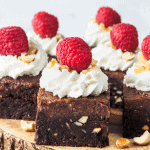 You can check out more of my vegan desserts here (most of them are paleo as well). I get lots of questions about what kind of vegan chocolate I use. Here you will find a very nice article from Peta, where they list the brands to look for. I personally really like using any Lindt Excellence Dark Chocolate. Peta says to look for the 70%, 85%, 90%, and 99% cacao varieties. And I love Enjoy Life quite a bit too. So those are my favorites. Experiment with different brands. There are lots of different brands out there now, and you get to try and see which one you like best. 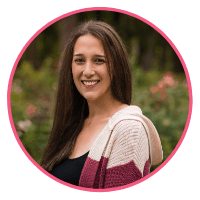 Thanks for reading my blog and trying my recipes! I get so happy with the messages, comments, pictures I receive from people who are trying my recipes. It makes me really happy and fulfilled to be sharing this passion with other bakers out there!!! Keep baking, happy people! 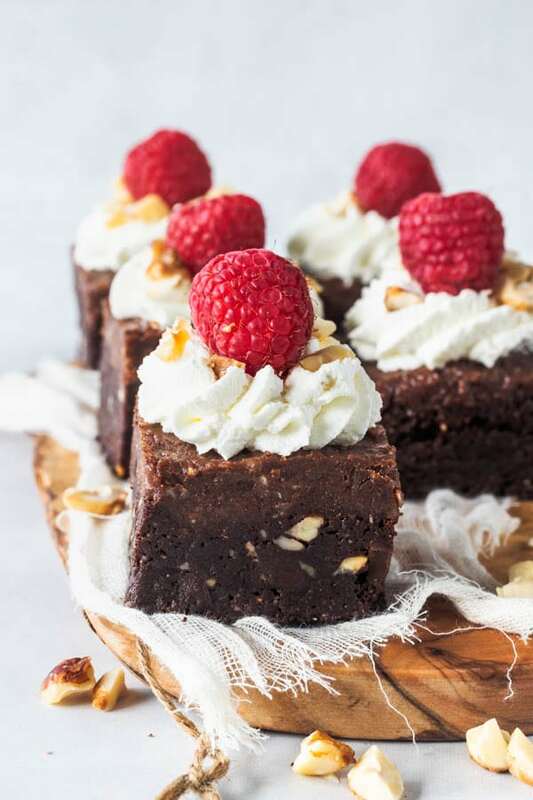 These Vegan Hazelnut Brownies feature a delicious vegan Nutella Frosting. 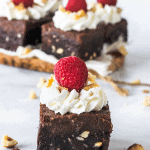 This delicious treat is also paleo, gluten-free, refined sugar free. Pre-heat oven to 350F. Line a 8×8” cake pan with parchment paper. Start by mixing the flax seeds with the water. Set aside for 15 minutes for mixture to thicken. Now mix the almond flour, cocoa powder, baking soda, coconut sugar, espresso powder, and fine sea salt, in a bowl together. Use a whisk to help incorporate all the ingredients very well. In another bowl, add 3/4 cup chopped chocolate and coconut oil. Place on top of a pan of simmering water. Whisk until chocolate is melted and incorporated with coconut oil. Add cashew butter, maple syrup, and vanilla extract. Whisk until smooth. Pour chocolate mixture over dry ingredients. Add flax seeds mixture to the bowl also. Mix with a spatula until incorporated. Add remaining 1/2 cup chopped chocolate and nuts. Mix until combined. Pour batter in the pan. Bake in the pre-heated oven for 15-20 minutes. Process for a few minutes, scraping in between, until a smooth mixture is formed. Whip cream on high speed for a few minutes until stiff peaks form. Spread Vegan Nutella over cooled brownies. Refrigerate for a couple of hours. 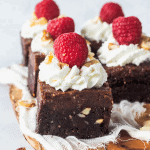 Slice and serve with whipped coconut cream if desired. 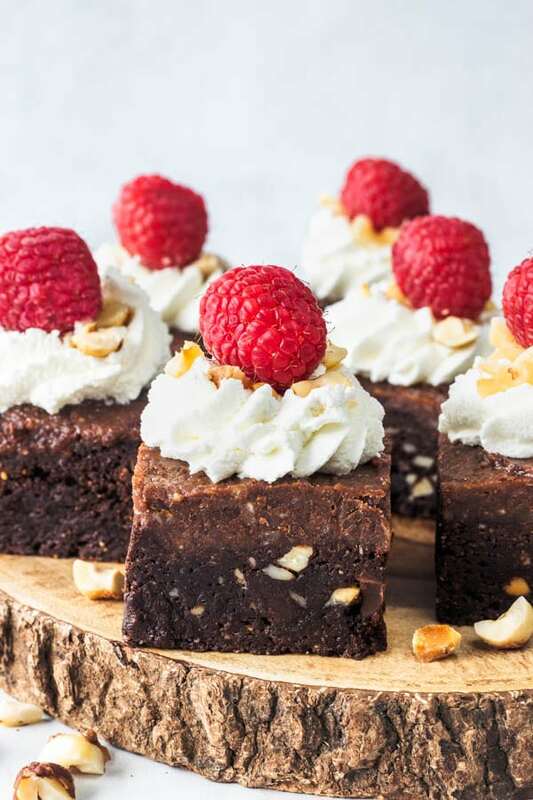 Ca, esse Brownie ficou de chorar de tão fantástico!!!!!! Sempre se superando!!!!!! Que site lindo e seus doces são uma delícia. The fishier the better and man these deliver! !